– Ongoing campaigns on TUI’s homepage and various landing pages. TUI have looked to approach this by making small and regular updates rather than opting to tackle one big campaign. TUI, the largest global travel brand, is often best recognised for their smile. Operating under numerous brands such as Thomson, First Choice and Riu they collect a vast amount of data across all of their sub brands, which is to be shared for sales insight and digital distribution throughout their organisation. Only 1% of TUI website traffic converts into customers so TUI turned to Tealium to help better control their data and understand visitor intent. TUI was looking to improve the user experience and increase customer conversion rates. After struggling to implement Adobe Analytics, TUI drastically reviewed their approach to data. In 2012 they started working with Tealium to build a foundational data layer so they could deploy analytics and other marketing technology vendors with ease. Since deploying Tealium iQ, TUI now has a strong data foundation, a reliable, yet agile tag management system in place, improved data quality and greater compliance control. Data management has been paramount for TUI to understand the intent of visitors on their website. Data volume had grown organically with the business but now that TUI is leveraging Tealium iQ they are able to better maintain, control and unify data from their disparate data sources. With a better view of visitor data, TUI realised they needed to move towards a more data driven, yet, customer centric approach. This meant improving their view of each customer to allow for a more advanced level of personalisation. In 2016, TUI added Tealium AudienceStream to their marketing stack. By building and testing segments in an agile style – fail fast, fix quick – TUI was able to launch onsite personalisation campaigns. Since using AudienceStream to stitch visitor engagements across their digital estate, the editorial team at TUI has been able to multiply campaigns with the flexibility to update and amend at any point. TUI has taken advantage of the integration connectors available with AudienceStream to align and stitch individual interactions with other touch points across the business. The enriched insight into visitor behaviour has given TUI a next level understanding of individual brand engagement, despite TUI having previously used a Data Management Platform (DMP). Being unsure of where DMPs will fit in the marketplace longer term, TUI has been using AudienceStream for greater data unification and stitching user profiles across multiple data points to provide website visitors with current, relevant content. TUI has significantly changed the approach to data management, so much so they have coined the term ‘Data DNA’. This reflects a firm belief from TUI that data should be at the core of any business with everything else being built out from the central point. TUI’s ability to view data in its entirety and to understand the insights that data provides is a unique competitive advantage. Data is therefore made readily available across TUI. In recognition that change is a constant and a consistent brand experience is vital, data at TUI is managed by a central team with distributed responsibilities. Sharing data with the wider team required additional or deeper insights and analysis of new or previously under used data points. To overcome this, TUI purchased Tealium DataAccess in early 2017. 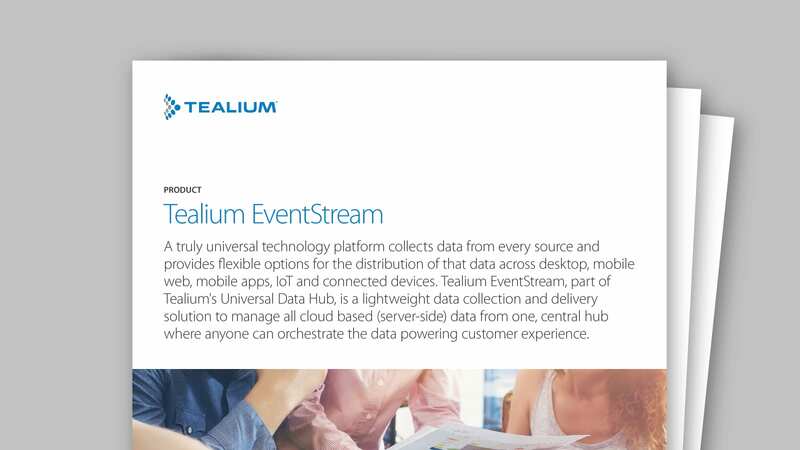 Acting as an extension of Tealium iQ and AudienceStream, Data Access has given TUI the ability to consume clean, relevant data about their visitors within their data warehouse and chosen business intelligence tools. Since deploying Tealium the volume of data that TUI collects and is able to act on has significantly increased. Despite unrivaled visitor profiling, TUI’s next challenge was to look at other areas of the user experience that would benefit from improvement. At the beginning of 2017, TUI started using Tealium Cloud Delivery to move tags away from the front end and give them more control. Google Analytics was the first tag for cloud delivery testing and following a successful migration TUI built a migration plan for their other vendor tags. Cloud delivery has given TUI more control and provided ‘next century tracking’ but additionally, has managed to improve page load speeds, reduce battery taxation for mobile visitors and further optimise website performance. Business, technology and innovation are continuing to evolve at a great speed and TUI is fully embracing this. Having realised the scope of data that can be collected, and with the upcoming General Data Protection Regulation, TUI has overcome data management challenges, leaving them confident for the road ahead. Even with the tightening of consumer consent, TUI is confident that their actionable insights will enable them to deliver a favourable and data driven value exchange for their customers. As the use of mobile and IoT devices rises, TUI is preparing to expand their use of DataAccess by integrating their DWH Systems. Secondly, any remaining visitor profile logic from 3rd party systems will be ported to AudienceStream to further enrich visitor profiles and maximise the potential return on data actioned. Finally, TUI is continuing to implement more cloud delivery use cases and migrating client side tracking to server side in order to reach new User Experience targets. Their next steps are to exclude further eCRM Tags, Analytics Tags and Remarketing Tag Requests from the page. TUI Group is the world’s number one tourism business. The brand portfolio, gathered under the Group umbrella, will consist of strong tour operators including 1,600 travel agencies and leading online portals, six touristic airlines with around 150 aircraft, over 300 hotels with 214,000 beds, 16 cruise liners and countless incoming agencies in all major holiday destinations around the globe. This integrated offering enables TUIto provide to our 20 million customers with an unmatched holiday experience in 180 regions. A key feature of our corporate culture is our global responsibility for economic, environmental and social sustainability. This is reflected in more than 20 years of commitment to sustainable tourism. In 2015/16 financial year the TUI Group with a headcount of 67,000 recorded turnover of €17.2 bn and an operating result of €1 bn. The TUI Group’s share is listed on the London Stock Exchange in the FTSE index and in the Quotation Board of the Open Market on the Frankfurt Stock Exchange.